The aim of this page is to list some of the Health and Safety regulations that exist to protect everyone working in live events. This is initially focussed on the UK, but will cover more territories in time. Every activity required to put on a show of any kind should have a series of procedures which are documented, regularly revised and reviewed, and followed by all involved in the activity. These documents should be available to anyone involved in the activity to review BEFORE the activity takes place. A Risk Assessment is a formal record of hazards in the workplace, identifying the risks they pose, defining the seriousness and likelihood of the risks, and explaining the control methods to reduce the risks to acceptable levels. How do I fill out a Risk Assessment? Can I download a sample risk assessment for a theatre? We’re working on a series of sample risk assessments, and these will be available to download in the coming months. The Work at Height Regulations 2005 have very clear guidance on using equipment to access high levels. See the Health & Safety Executive (UK) guidance. All portable electrical equipment must be periodically tested to ensure it is safe to use, and the results should be recorded for future reference. A large percentage of faults can be easily found by carrying out a visual check. Is the flex correctly secured in the plug? Is the cable free from any breaks, cracks, temporary repairs or other damage? (any electrical tape on the cable should be removed, and if a problem is found, the equipment should be taken out of service). 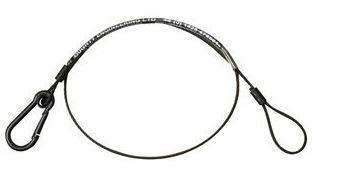 Can any of the inner cores of the cable (usually coloured brown, blue and green/yellow) be seen through the outer protective cable sheath? Is the case fully intact and unbroken? Are there any marks on the equipment or plug which may indicate overheating? Does the equipment work as intended? If any of the above checks fail, the equipment must be taken out of service and repaired by a competent person. 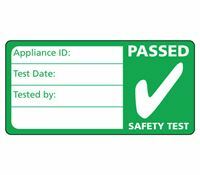 Further information about electrical tests and checks can be found on the HSE website. The need for secondary safety supports is covered under the Work at Height Regulations 2005. The Work at Height Regulations 2005 require employers to take steps to ensure that people can’t be hurt by falling objects. This involves assessing the risks and taking action to control them. If the theatre’s risk assessment suggests this is best managed with steel wire rather than chain then they have a duty to implement that control. As an employee, you have legal duties to co-operate with your employer to ensure they can comply with their duties. Professional bodies such as the ABTT in the UK, and standard professional practice, require safety wires to be used on all suspended equipment. In the UK, safety chains were formerly used, but these should not now be used as the chain cannot be certified to carry a particular load. Safety wires (made for the purpose) are properly rated, and stamped with the rating. A range of wires are available, from stage equipment suppliers, rated to carry loads from 5kg (for accessories such as barndoors) to 100kg (for larger lanterns and moving lights). Ensure the signs can be seen by everyone entering the venue. All items used on stage should be adequately fire-resistant. This includes scenic drapes and costumes. Where fire risks are increased (e.g. near pyrotechnic devices, hot lighting equipment) then extra precautions should be taken. All systems connected with safety must be regularly maintained and tested. The frequency of testing will be set by local regulations. Visual checks should be carried out every time an item (e.g. a ladder) is used. If there are signs of damage, it should be referred to the responsible person to be tested and if necessary replaced. No equipment that raises concern during a visual check should be used if a different item is available. British Association for Performing Arts Medicine. Specialist health and safety support for performers and technicians. Short for British Academy of Stage and Screen Combat. UK Regulations introduced in 2015 covering any construction project. Many live event construction projects (e.g. building set, raised stages etc) are covered by the regulations. An alternative plan of action if a piece of technology fails to operate. Large-scale productions have to continue wherever possible to avoid having to give the audience refunds. So if a small piece of the set fails to work or gets stuck (particularly automated scenery) the cast and crew will have rehearsed an alternative choreography to work around it while the crew repair it. For example in The Lord of the Rings The Musical in London, when the revolving stage with multiple lifts had a safety sensor triggered, the automation went into 'E-Stop' mode, a thunderclap sound effect was triggered, the stage lifts went to a flat floor (once it had been found safe to do so) and the actors for the next scene were rushed into new positions, while the actors on stage immediately adopted a new choreography. It's vital that contingencies are worked out in advance so that as soon as something goes wrong, the show can continue, and the audience will hopefully be unaware. (UK Health and Safety) Acronym for Control of Substances Hazardous to Health Regulations 2002. Requires employers to prevent or reduce their workers' exposure to substances that are hazardous to their health. As well as dangerous chemicals and solvents, COSHH also covers ANY substance that is hazardous, including dust particles in a set-building environment. Acronym for International Code of Practice for Entertainment Rigging. A new standard, published in 2017. Abbreviation for Lifting Operations and Lifting Equipment Regulations 1998 (UK Health & Safety Executive). Material Safety Data Sheet. Form available from manufacturers of, for example, smoke fluids. Lists any hazardous ingredients and other safety-related data about the product. Short for Portable Appliance Test. Requirement under the UK Electricity At Work Regulations (1989) to test and inspect all portable electrical equipment. This includes stage lighting equipment (lanterns, cables, portable dimmer packs etc.). (UK - Health & Safety) Abbreviation of Personal Protective Equipment. The equipment that's needed depends on the task and risk assessment but could include: steel toe-capped boots / shoes, protective headgear, gloves etc. Acronym from Risk Assessment & Method Statement. RAMS is the paperwork that you should provide when undertaking any activity that requires it. A Risk Assessment is a document listing the risks and hazards involved in a particular activity, highlighting what controls are in place to reduce the risk to an acceptable (safe) level. Chain or wire fixed around lantern and lighting bar or boom to prevent danger in the event of failure of the primary support (eg Hook Clamp). A requirement of most licensing authorities in the UK. As a standard safety chain does not have a rated loading, current recommendations in the UK is to use an approved (and rated) safety wire (also known as a safety bond) as a secondary suspension. Although hook clamps (in the UK) that support lanterns do not fail, they are subject to a number of human failings including not doing the clamp up sufficiently or not tightening the bolt at the base of the hook clamp that connects to the lantern. However, the highest risk is due to a flown lantern being struck by a piece of scenery or another lantern as it flies past. A fireproof "curtain" that can be dropped downstage of the house tabs in a proscenium theatre to separate the audience from the stage in the event of fire. A Safety Curtain is required by most UK licensing authorities for theatres of traditional design. The regulations also require that it is raised and lowered at least once in view of each audience (usually during the interval). Usually made from sheet metal and electrically operated, these curtains were originally of iron construction faced with asbestos and lowered by gravity using a hydraulic damping system. Colloquially known as the "iron". Some Safety Curtains are painted - the iron at the Theatre Royal Drury Lane has a beautiful design with the text "For Thine Especial Safety". The musical Billy Elliot uses a false iron as a scenic device with a pair of doors in it, which would not be permitted for a real iron. The line on the stage where the fire curtain drops, usually a short distance from the downstage edge of the stage, is known as the FIRE CURTAIN LINE and cannot be obstructed by any fixed scenery. Also known as FIRE CURTAIN, IRON or ASBESTOS. See also DRENCHER. A safety sensor on the edge of a piece of automated scenery (usually a moving platform) that the automation system uses to detect something or someone out of place and take appropriate action. When an emergency situation means the performance cannot continue, a SHOW STOP is announced. The stop would be called most often because of a safety issue (e.g. a piece of scenic automation is stuck in a dangerous position, or is blocking the stage or flytower in such a way that the show cannot continue. Or a performer has been injured). The audience may be asked to leave the theatre (and be issued refunds) or be asked to remain in their seats while the situation is corrected. For example, if a trapdoor is stuck open, the show must be stopped until it can be closed and made safe. A heavily automated show should have a pre-recorded announcement, but it may be more human / theatrical to have a member of the stage management team or the company manager to walk on stage with the houselights up and make an announcement along these lines: 'Ladies and Gentlement, sorry to interrupt the performance, but we've had to pause the show here for a few moments while we reset some technical equipment to enable us to continue safely. Please remain in your seats - the performance will continue shortly'. Obviously if there's a major failure and it's unlikely the performance will be able to continue, the procedure should be to apologise to the audience, to give them information about how to obtain a refund or another ticket, and then to ask them to leave the auditorium. (UK Health & Safety) Any structure built for an event, whether it's staging, seating or a marquee or similar outdoor structure. Australian equivalent of the UK "PAT" Test - a regime for testing electrical equipment for safe operation and then logging the results. A framework of alloy bars and triangular cross-bracing (usually of scaffolding diameter) providing a rigid structure, particularly useful for hanging lights where no permanent facility is available. Very often box-shaped in cross section, so known as BOX TRUSS. This type of truss is useful for touring as lanterns / speakers etc can be hung inside the truss which protects them when loading and takes up less space in the truck. You should only use truss from reputable manufacturers, and should check the manufacturers' website for instructions on how to use it, and what limitations it may have. Rigging a truss incorrectly can vastly reduce its' safe working load, and can result in damage to the truss,or a far more serious failure. Always seek advice from professionals, and do not attempt to rig equipment without proper advice or supervision. (UK - Health & Safety) Abbreviation for Working Load Limit.